I love the internet, not only is it a great source of knowledge and entertainment but it also provides many ways to make money online. Yes, making money online is real and there are legitimate methods that anyone can use to start an online business and eventually quit their day (or night) job. However, unlike what you may have been told, you do not need to shell out hundreds or even thousands of dollars on online courses to start making money online. There are many ways to make money online, every legitimate method will take time and a lot of dedication, anyone that tells you any different is most probably trying to sell you a get rich quick scheme. Please do not ever buy into programs that promise to reveal how you can be making life changing income within a few weeks or months, you will be disappointed and I talk from experience. There is no legitimate online business model that can make you rich overnight. One method that you will not see in this article is taking surveys, yes you can make money online by taking online surveys but it is not a proper method to start an online business. Don’t pay to take surveys, sites that require you to pay a monthly or one-time fee are not legitimate survey sites and should be avoided! The first two methods in this guide are my personal favourites and although there are more ways to make money online, I didn’t want to overwhelm my readers with too many options which often leads to analysis paralysis and procrastination. One final piece of advice before I reveal my favourite ways to make money online and that is you must take action and not try and consume everything about any of the methods mentioned in this article. Fear of failure is the primary reason people do not take action, some believe they do not have all the information, others think it may be the wrong information while others have too much information they do not know where or how to start. Failure is good!! Failure is inevitable, it is how we finally succeed by learning from our failures, so do not be afraid to fail and start taking action as soon as possible. So, without any further delay, these are my personal ways to start an online business. Affiliate is my no.1 method to make money online and it is the method I use to monetise my own websites. There are many ways to start an affiliate marketing business, the best way is through starting a niche website or blog. 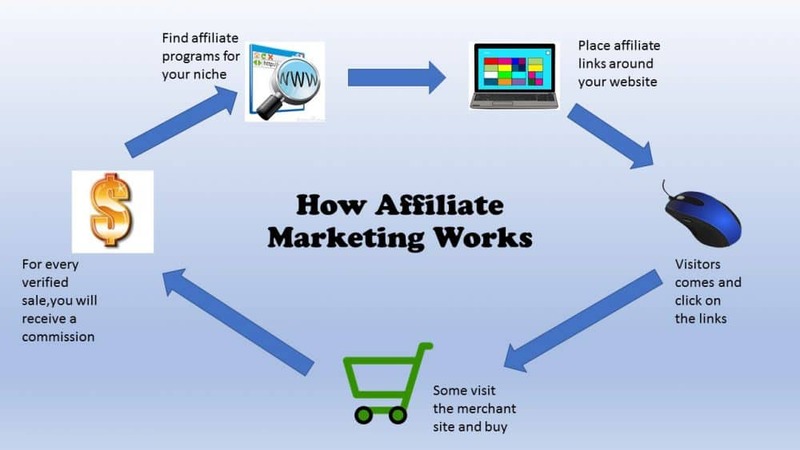 For those who are not familiar with affiliate marketing and how it works, it is simply selling the products or services of other businesses and earning a commission when you make a sale. Nearly all the biggest brands in the world run an affiliate program that you can join and promote. Whatever your interest is, there is a high likelihood that a company runs an affiliate program for it. One of the most popular affiliate networks is Amazons associates program this is because you can earn a commission on everything they sell. Since they sell nearly everything under the sun, it is highly likely that you will find something within your niche that you can sell as an affiliate. However, you are not just restricted to Amazon, there are thousands of affiliate programs to choose from. You just have to find one that is relevant to your niche. Research and find your niche – This is probably one of the most time-consuming parts but has to be done properly for you to put yourself in the best position to succeed. Research content ideas – You will need to come up with article ideas for your website, this is what will be attracting visitors to your site. You will need to do research into what your target audience is searching for and then produce high-quality content around those search terms. This is also another task that will b time-consuming, but if it is done correctly, it will result in consistent traffic to your site. Generate traffic – There are many ways to generate traffic to your site, one of these ways is through SEO. SEO stands for ‘search engine optimisation’ and is the process by which you would go about ranking your website on the search engines. Other methods include Social Media Marketing and Video Marketing. Choose one method you are comfortable with and master it before moving on to other sources of generating traffic. Find and promote affiliate offers – Now, we come to the exciting part, finding affiliate offers that will eventually make us some money. I have already mentioned some of the biggest affiliate networks but do your own research and find ones that are relevant to your own niche. The above is only a guideline, there are more thorough resources that will guide you through start to finish on how to begin an affiliate marketing business. I personally recommend the training provided by Wealthy Affiliate, they have a free and paid membership, the free membership includes a 10 part introductory lesson into affiliate marketing. I personally use the training and tools provided by Wealthy Affiliate and it has helped me a lot, it is the reason why I recommend them to anyone looking to start making money through affiliate marketing. However, you should do your own research into what training program provides the best value, there are other programs besides Wealthy Affiliate, choose one, follow the training and take action. The online retail world is booming and is set to grow exponentially over the next few years. When I first started thinking about running an online business, eCommerce was what I had in mind. The opportunities are endless and if done right, it’s very rewarding as well. According to eMarketer, worldwide retail eCommerce sales will be almost $5 trillion with mobile commerce making up over 70% of that total, this represents a huge opportunity for entrepreneurs to start an eCommerce business. Starting a traditional eCommerce business requires you to invest a substantial amount of capital to get started. You could be looking to need anywhere between $3-$5 thousand just for inventory and storage fees. If you do have that kind of a budget, one of the best ways to get into eCommerce is to start selling on Amazon through their FBA program. FBA stands for Fulfilled by Amazon and it is basically a service in which Amazon stores your inventory and delivers them to your customers. There are fees for this service but it can be very rewarding if you manage to identify a good product to sell. There are lots of websites that provide free training and resources that will show you how to get started with selling on Amazon through their FBA service. I highly recommend you visit these sites and use the free resources and training guides if you want to start an Amazon FBA business. Jungle Scout – A name that most Amazon sellers will recognise, they have developed a set of software applications that help people find profitable products to sell on Amazon. Apart from developing fantastic apps, they also have a huge range of free resources on how to start an Amazon business. Startupbros – A fantastic blog related to all things eCommerce and especially focusing on Amazon FBA, Will Mitchell, the man behind this blog is a successful entrepreneur who has a multi-million dollar Amazon business. He has his own Amazon course but you should definitely read his mammoth guide to selling on Amazon. Andrew Minalto – Andrew is a successful businessman from the UK, he had a very successful business on eBay and recently decided to start an Amazon FBA business. He regularly posts on his blog about his Amazon business, he also has a huge range of resources for those looking to start selling on Amazon. He mainly focuses on the UK market but is delving more on the US market as his business starts to grow. The Amazing Seller – Run by successful Amazon seller, Scott Voelker, this website has a good range of resources on how to sell on Amazon. Scott also has a very successful podcast and YouTube channel and has his own Amazon training course. The Selling Family – A blog run by a family of three, Jessica, Cliff and their son Aiden, they run a multi-million dollar Amazon business and have been featured on many popular websites. They have a wide range of fantastic articles including a mammoth 9000-word guide on how to start an Amazon FBA business. They also have their Amazon course which is one of the cheaper Amazon courses I have come across. Kevin David – I was only recently made aware of this person but he is a very successful eCommerce entrepreneur who is selling both on Amazon and Shopify. He has a website but it doesn’t really have much content, it’s only to funnel his visitors to his webinar and then to his paid courses. It’s his YouTube channel that really stands out, he has a ton of videos on how to start an Amazon business and expands upon other areas of eCommerce as well as different ways to make money online. If you don’t have enough capital to start a stock and ship eCommerce business, there is an alternative low-cost method called drop shipping. For those of you who have not heard of dropshipping, it’s basically selling physical products without having to stock any inventory make any delivery arrangements. 2. You find a supplier for this product who is willing to dropship for you. 3. You list the item(s) in your store. It is a business model that is gaining in popularity especially for those who want to make money online but are on a limited budget. This is the eCommerce model I prefer as it is simple to set up and not as expensive as starting a traditional eCommerce store. I have written an article on what dropshipping is and how to get started. It is by far the easiest way to start an eCommerce business. Store Coach – Run by three brothers who have over 15 years of experience in the eCommerce world, they provide a variety of services including a free and paid membership on how to start a dropshipping business. They also run a consulting service for those who would like a more on-one approach and a website brokering service. For a full review of the training provided by Store Coach click here. Franklin Hatchett – A very successful blogger and YouTuber who makes money through affiliate marketing and dropshipping. Has lots of videos on his YouTube channel on how to start making money online through dropshipping with Shopify. Also runs a very popular dropshipping course called eCom elites. I highly recommend you check out his YouTube channel just for the ton of value he provides. Kevin David – As well as running a successful Amazon FBA business, Kevin David also runs a very successful dropshipping business and provides tons of tutorials on his YouTube channel. You should definitely check out his channel just for the awesome content he provides. I also highly recommend the following websites for awesome content on dropshipping. Shopify – The leading eCommerce platform has a ton of resources on all things dropshipping. Oberlo – A dropshipping app that works exclusively on the Shopify platform. The website has lots of free training and resources on how to start a dropshipping business. AliDropship – AliDropship is a WordPress plugin that works in similar fashion to Oberlo, it has a lot of automation features that will make the day to day running of a dropshipping business much easier. The website also has lots of free guides and training on starting a dropshipping business. eCommerce is growing fast and I have only listed some of the training available, there are others but also be aware there some of these courses require massive investment. So, do your due diligence before signing up for any of the high-cost training courses that are now flooding the internet. Freelancing is a fantastic way to start your own side business and make money online. There are approximately 2 million freelancers in the UK and nearly 58 million in the USA. The number of freelancers (and self-employed overall) grew exponentially after the financial crisis of 2008. This is a very good time for those looking to get into freelancing as more businesses are finding it more financially prudent to hire freelancers. The great thing about freelancing is there is zero upfront cost, it is a great way to start earning some extra income to supplement your main source of income. As you get more clients and your portfolio stars growing, you will eventually transition to a full-time income and quit your job. As long as you have an in-demand skill set you can start freelancing straight away. If you are not sure of what kind of service to provide, just visit one of the popular freelancing sites like Fiverr or Upwork and see what freelancing services others are offering. This will also give you a good idea on what prices to charge and how long clients are willing to wait for projects to be completed. You may have different passions, I only mentioned freelancing in digital marketing because that is what I know. Emil Lamprecht How To Become A Successful Freelancer. The graph below shows the estimated growth for mobile apps by the year 2020 to be around $188.9 billion dollars. This is a good time to start a mobile app business.